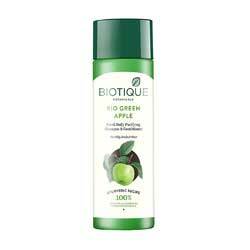 Biotique is based on 5000 year old Ayurvedic recipes known to integrate and celebrate body, mind and spirit. This is the heritage and harmony of all Biotique products, blending proven Ayurvedic therapies with the science of 21st century bio-technology. Green Apples have been natures "health fruit" since the beginning of time. This refreshing formula is blended with pure green apple extract, sea algae and centella, to purify and nourish the scalp and hair with natural minerals and proteins. Special pH balanced formula is gentle enough to use every day. Leaves hair refreshed and full of natural body and shine. Organically Pure & Preservative Free No Animal Testing.